WHOLESOME! IS COMMITTED TO PROVIDING THE MOST DELICIOUS FAIR TRADE CERTIFIED, ORGANIC, NATURAL AND NON-GMO SWEETENERS. PLUS, THEY ARE SOURCED FROM ETHICALLY AND ENVIRONMENTALLY RESPONSIBLE GROWERS AND MANUFACTURERS. 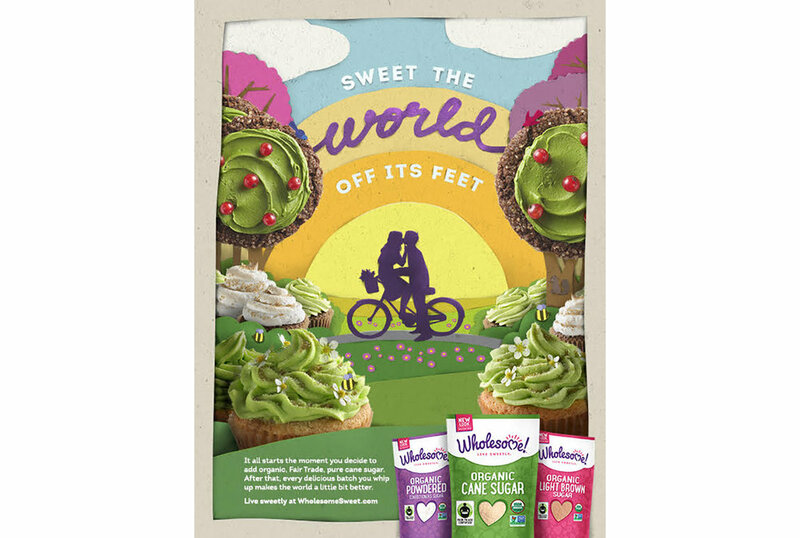 TO HELP TELL THEIR STORY, WE CREATED A CAMPAIGN THAT BROUGHT THE LOVE OF SWEETS AND BAKING TO OUR TARGET AUDIENCE. WE CREATED A PAPER CRAFT CONCEPT THAT CONTINUED THE IDEAS OF HAND MADE AND ORGANIC WITH WHIMSICAL SCENES OF VIBRANT COLORS AND BAKED TREATS. FROM TRADITIONAL MAGAZINE ADS TO PRE-ROLL AND SOCIAL, WE SPREAD THE WORD ON HOW DELICIOUS WHOLESOME! SWEETENERS ARE!